‘Under a battleship grey sky’ from The Scotsman. Reflecting on widespread redundancies which leave BAE’s yards in Glasgow decimated, but open. ASK Glaswegians what they understand by the term, Clydeside, and the answer will be split along generational lines. For the young, it is the lexicon of marketeers, a phrase peppered across billboards and glossy brochures signalling the city’s evolving transformation, a process that is slowly reclaiming vast tracts of dormant waterfront with conference centres, casinos, media parks and mid-rise flat complexes. Greying residents, however, will look back, recalling an era when their peers forged not only ironclad leviathans, but Glasgow’s sense of itself. 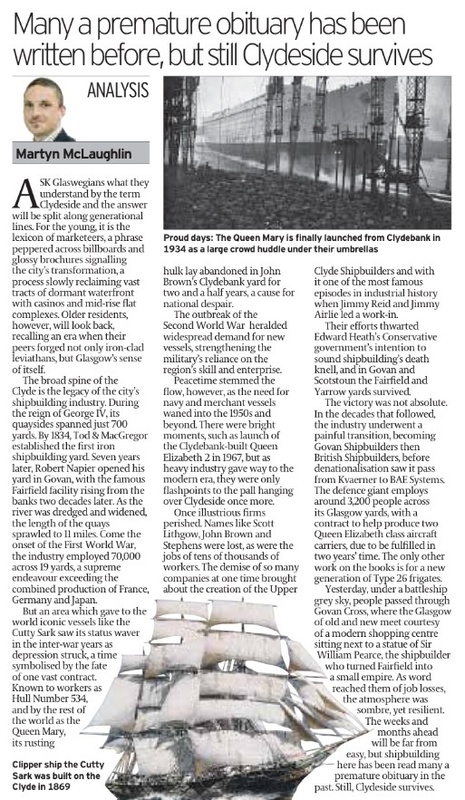 The broad spine of the Clyde is the legacy of the city’s shipbuilding industry. During the reign of George IV, its quaysides spanned just 700 yards. All that would soon change. By 1834, Tod & MacGregor established the first iron shipbuilding yard. Seven years later, Robert Napier opened his yard in Govan, with the famous Fairfield facility rising from the banks two decades later. As the river was dredged and widened, the length of the quays soon sprawled to 11 miles, encompassing not only Glasgow but towns such as Greenock and Clydebank. Come the onset of World War I, the industry directly employed 70,000 across 19 yards, a supreme endeavour exceeding the combined production of France, Germany and Japan. The Cunard Line’s flagship would eventually be completed and the yards seemed to have emerged from the gloom. The outbreak of World War II heralded widespread demand for new vessels, strengthening the military’s reliance on the region’s skill and enterprise. Peacetime stemmed the flow, however, as the need for for navy and merchant vessels waned into the 1950s and beyond, as cheaper labour costs prevailed and overseas competitors thrived. There were bright moments, such as launch of the Clydebank-built Queen Elizabeth 2 in 1967, but as heavy industry gave way to the modern era, they were only flashpoints to the pall hanging over Clydeside once more. Once illustrious firms perished. Names like Scott Lithgow, John Brown and Stephens were lost, as were the jobs of tens of thousands of workers. Communities like Greenock and Clydebank entered periods of hardship from which they have only started to recover and families with three generations reliant on a single company endured terrible hardships. The demise of so many companies at one time brought about the creation of the Upper Clyde Shipbuilders and with it, one of the most famous episodes in industrial history when Jimmy Reid and Jimmy Airlie led a work-in. Their efforts thwarted Edward Heath’s Conservative government’s intention to sound shipbuilding’s death knell, and in Govan and Scotstoun the Fairfield and Yarrow yards survived. The victory was not absolute. In the decades that followed, the industry underwent a painful transition, becoming Govan Shipbuilders then British Shipbuilders, before denationalisation saw it pass from Kvaerner to BAE Systems. The defence giant employs around 3,200 people across its Glasgow yards, with a contract to help produce two Queen Elizabeth class aircraft carriers, due to be fulfilled in two years’ time. The only other work on the books is for a new generation of Type 26 frigates. Today, under a battleship grey sky, people passed through Govan Cross, where the Glasgow of old and new meet courtesy of a modern shopping centre sitting next to a statue of Sir William Pearce, the shipbuilder and politician who turned Fairfield into a small empire. As word reached them of hundreds of job losses, the atmosphere was sombre, yet resilient. The weeks and months ahead will be far from easy, but shipbuilding here has been read many a premature obituary in the past. Still, Clydeside survives.